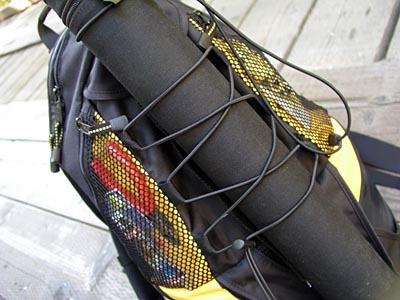 Introduction: A backpack for anglers that�ll carry fishing gear, has a hydration system, and is 100% waterproof for sure protection of your expensive camera or electronics� too good to be true? 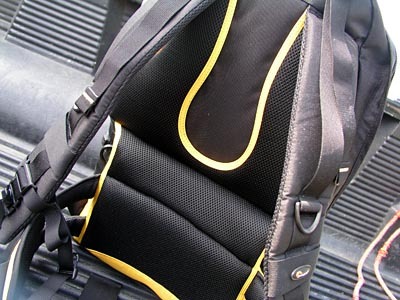 TackleTour has found the backpack for you. Introducing the Lowepro DryZone Rover, a camera bag with a water-resistant and a waterproof compartment to keep your investment dry while you�re out on your fishing adventures. About Lowepro: If you�ve owned a camera then you�ve probably heard of Lowepro. Lowepro was founded 30 years ago out of a garage in Colorado and today has become an innovative leader in camera carrying systems serving professional and consumer level photographers along with outdoorsmen. Their camera bags range from small pouches to backpacks to rolling cases that are capable of many applications. Today, Lowepro continues to develop innovative storage solutions for cameras, PDAs, laptops, and other electronic devices and their product is available in over 90 countries worldwide. Impressions: You might wonder why TackleTour is reviewing a product from a camera bag manufacturer. The answer is simple, almost all anglers today use a camera and protecting your investment is crucial. Lowepro makes a few waterproof backpacks that have the capacity to carry fishing gear and at the same time have a complete system to keep your camera and other electronics completely dry. This brings us to the Lowepro DryZone Rover, a backpack with two main compartments, one being water-resistant and the other 100% waterproof. First when you set eye on the Rover, you might think it�s a big backpack, weighing 5.13 pounds, but remember this bag was made for people who will go on day hikes, trek to hidden lakes, or wade up and down the river throughout the day, so the ability to carry a good amount of supplies is essential. The Lowepro DryZone Rover is actually quite impressive. It has many useful features that anglers will surely fall for. Design: I came upon the DryZone Rover while searching for a waterproof bag to protect my digital SLR camera and lenses (an investment of over $5,000) while traveling to fishing destinations in any type of weather condition. 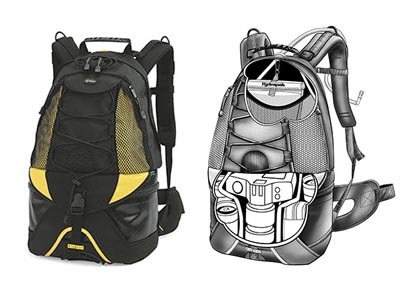 After setting eyes on the Rover and further analyzing it, this backpack had the design that matched my needs as an angler, photographer, and adventurer. 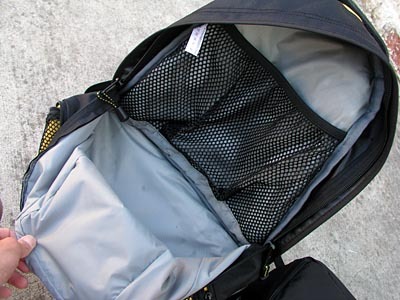 On the outside there are two mesh pockets that can hold tools and other small fishing tackle. 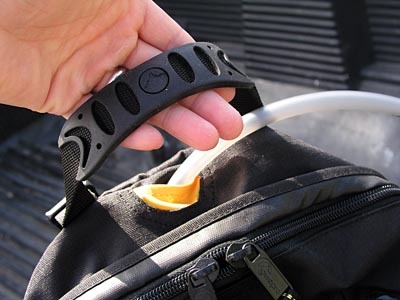 These pockets are closed by zippers to make sure your items remain secure while you�re fishing. Along the same side there�s a tripod holder that I thought could double as a rod holder (more on that later in our field tests) and webbing along with other elastic loops to secure items on the exterior. On the other side you�ll notice the shoulder and waist straps, all well padded with DryFlo, a highly breathable mesh-covered padding material. The back is also padded with the same material in an effort to provide better comfort while wearing the DryZone Rover all day fishing. 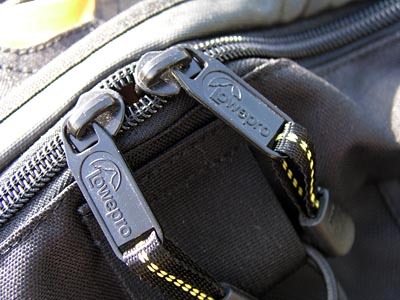 On the Lowepro backpack you�ll also notice a tube sticking out from the top. This is the hydration system tube where one can quench their thirst without taking the backpack off and has some features that�ll make taking that refreshing drink easier and trouble free. Carefully analyzing and operating each part on the Lowepro DryZone Rover, you�ll notice the backpack uses top notch components and material. Zippers appear to be rugged, fabric is of high quality, every other little part seems to be a right fit for a waterproof bag like the Rover. 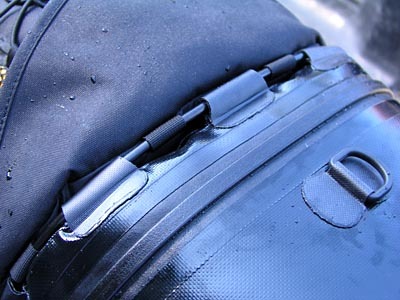 The Rover also provides a somewhat rigid structure between the top and bottom compartments via some sort of cable support system, and it does a good job at preventing the bag from laying there limp. The upper water-resistant compartment is quite large and can hold a lot of gear, lunch, or anything else you wish to carry. The upper portion also holds the hydration system. 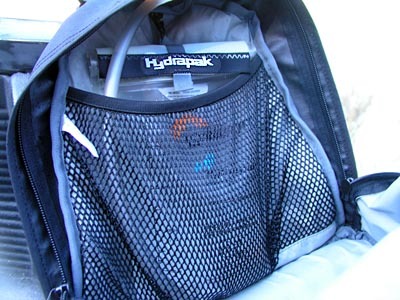 Inside there�s a meshed pocket that holds the Hydrapak which carries 50 FL OZ / 1.5 Liters of water or your favorite sports drink. The design of the bottom portion is outstanding. 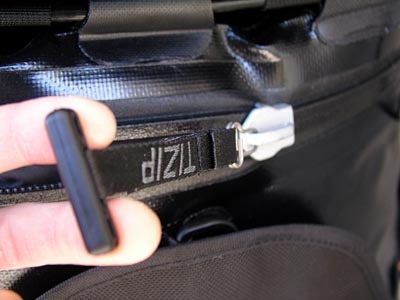 The DryPod is completely sealed via TIZIP waterproof zippers. 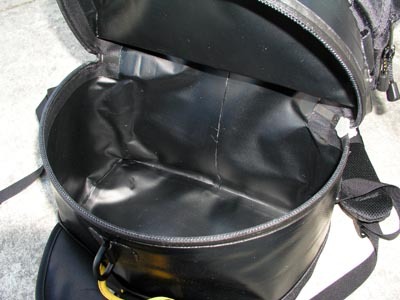 The exterior material is similar to dry bags but more durable. 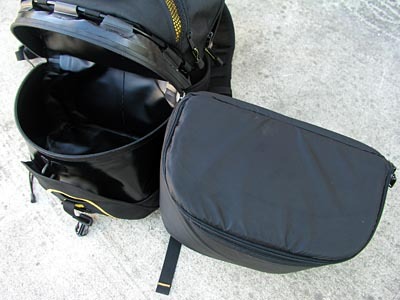 Inside the waterproof compartment there�s a removable padded camera insert with adjustable dividers. Anglers will be able to use this padded pouch or remove it to hold other items such as sensitive electronics or more fishing gear.